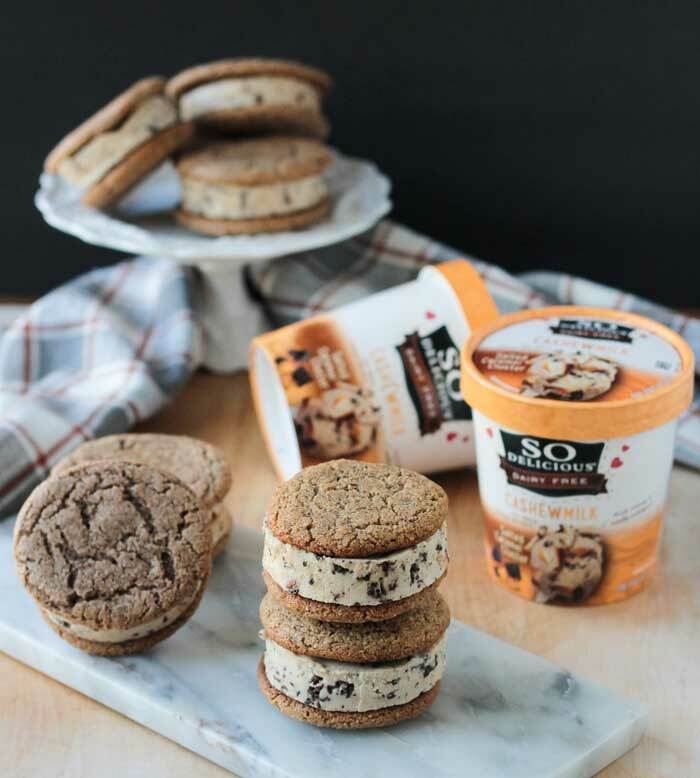 Cookie Sandwich made with Gluten Free Cinnamon Sugar Cookies and Salted Caramel Non Dairy Frozen Dessert – so easy, yet so indulgent! The perfect summer treat! Summertime is not over yet, my friends. It’s been really humid around here lately. And what is better in the hot summer heat than cool, frozen, sweet treats? Not much. 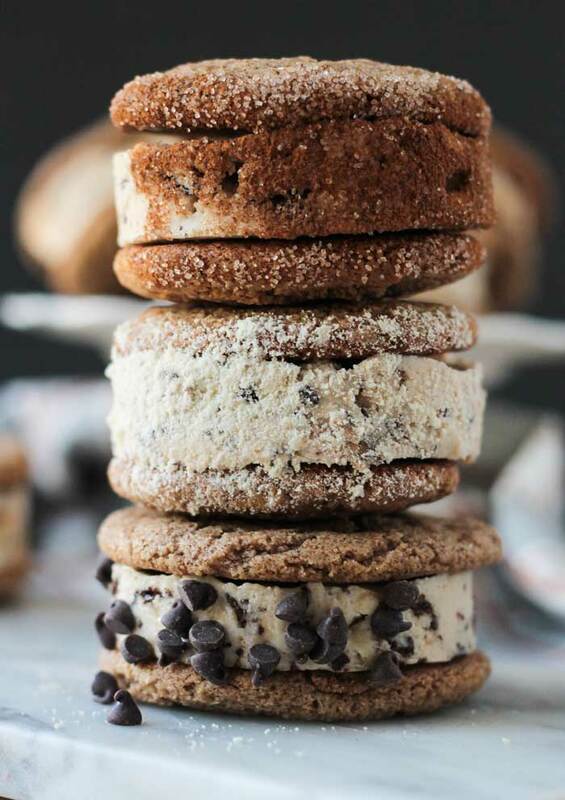 So today, I’m bringing you these super decadent frozen Cookie Sandwiches made with the perfect Cinnamon Sugar Cookies and ultra creamy Salted Caramel Cluster Non Dairy Frozen Dessert. It’s the perfect combo! You guys, these are so easy, you won’t believe it. I suggest you run to your kitchen right now to get started! If you follow me on Instagram, then you know I’ve been in love with So Delicious Dairy Free® Non-Dairy Frozen Desserts since last year when I finally found the cashew milk snickerdoodle variety (<- omg, so good!). 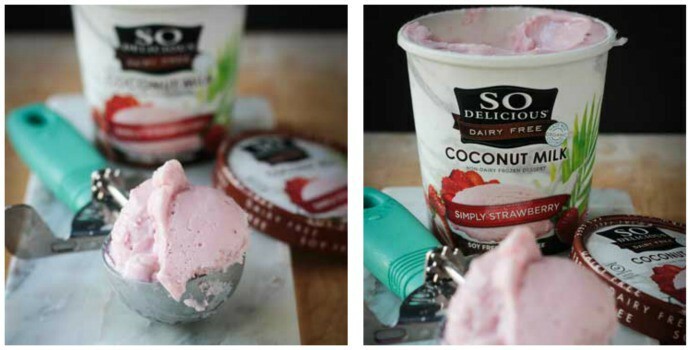 So Delicious Dairy Free® uses high quality, 100% plant based ingredients and never any artificial flavors, colors or preservatives, trans-fats, hydrogenated oils, or high-fructose corn syrup. They have 25 years of experience bringing delicious dairy free products to the marketplace. It’s a brand you can trust to deliver the taste and texture you are looking for in non-dairy products. I do the bulk of my grocery shopping at Walmart. It’s convenient and affordable. So, imagine my joy when I discovered they carried So Delicious Dairy Free® products, especially the indulgent non-dairy frozen desserts! 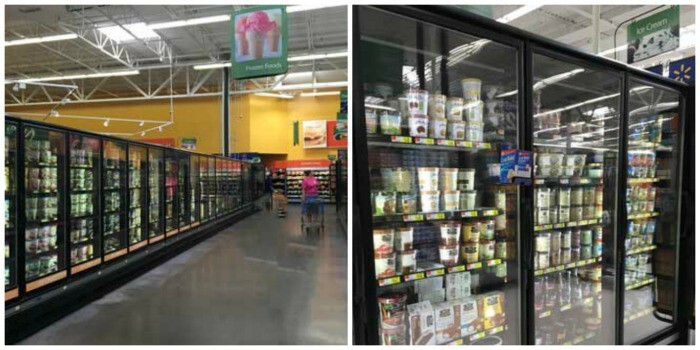 They can be found in the freezer aisle, as shown in the photos above. For this Cookie Sandwich recipe, I chose the Cashew Milk Salted Caramel Cluster. It’s so good on it’s own, but taken up up a notch by sandwiching it between delicious chewy cookies. At Walmart, you can find all the ingredients (only 6 needed!) to make the Cinnamon Sugar Cookies, as well. Snickerdoodle and Salted Caramel Cluster aren’t the only awesome flavors you’ll find from So Delicious Dairy Free®. They have varieties made from cashew milk, coconut milk, and almond milk, offering flavors such as: Cherry Amaretto, Chocolate Peanut Butter Swirl, Mint Chip, Mocha Almond Fudge, Vanilla Bean, Cappuccino, Dark Chocolate Truffle. And, let’s not forget about this beautiful Coconut Milk Simply Strawberry that I told you about last month. It is the perfect frozen strawberry treat! I love that beautiful pink color! 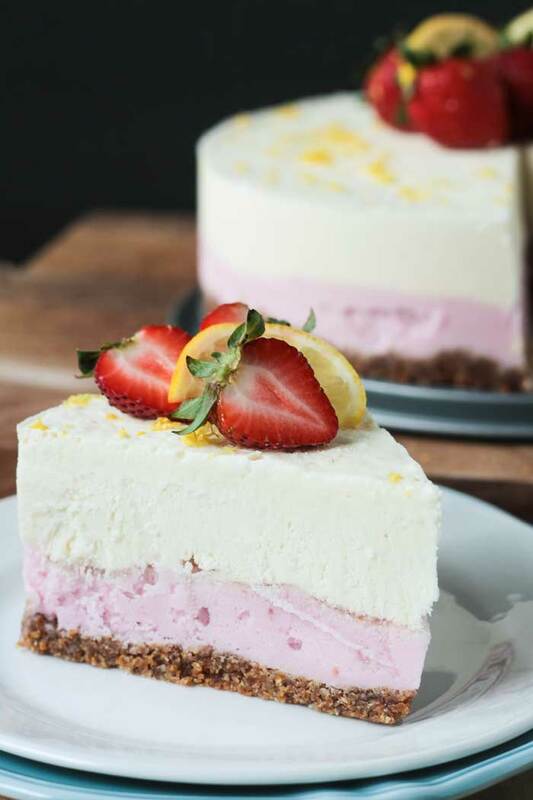 In case you need a reminder about my Simply Strawberry creation, check out this gorgeous pic again of the Strawberry Lemonade Cake I made with 2 pints of the creamy pink frozen dessert! If that doesn’t scream summer, I don’t know what does. Cool, sweet, tart, refreshing, perfect. Aaaaaahhhhh. Let’s get back to these frozen Cookie Sandwiches. The cookies I chose to use for this recipe are my Gluten Free Cinnamon Sugar Cookies. The cinnamon sugar compliments the salted caramel so deliciously. The cookies are perfectly chewy, and when frozen have a great little crunch while still being soft enough to easily bite through. I’m telling you – this combo- it’s true love! Now, if you want to take these Cinnamon Sugar Cookie Sandwiches up to even another level, you can roll them in some sweet extras. I chose to add several extras because it’s dessert – let’s go all out! 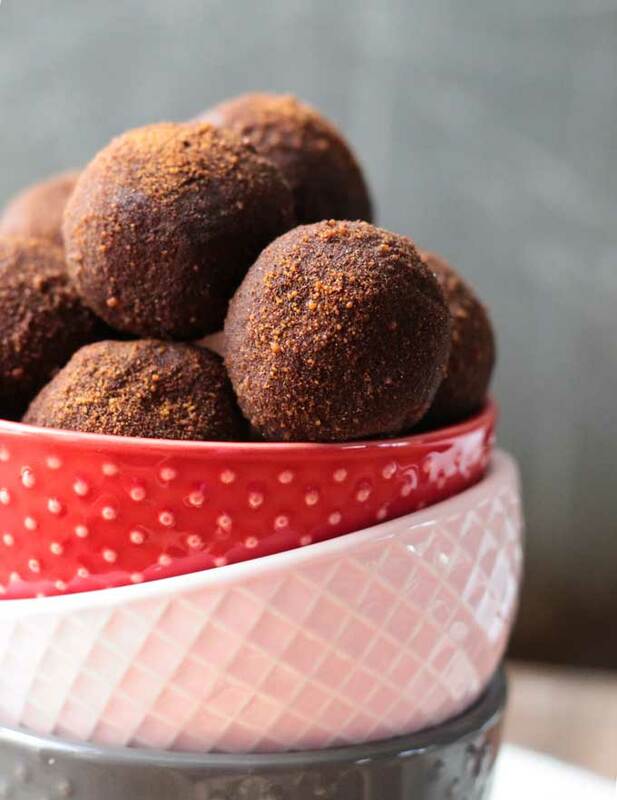 I used mini chocolate chips (chocolate makes everything better), crushed raw cashews (naturally sweet – blitzed in my coffee grinder), and a cinnamon sugar mixture (this was my favorite!). Extras are optional, but highly recommended! I am so excited for you guys to try these!! I love hearing from you, so please come back here and leave me a comment with your feedback and star rating after you try them. I would love to see those remake photos too! Find me on social media and tag @veggie_inspired and #veggieinspired so I’m sure to see them! Now go make these ASAP! 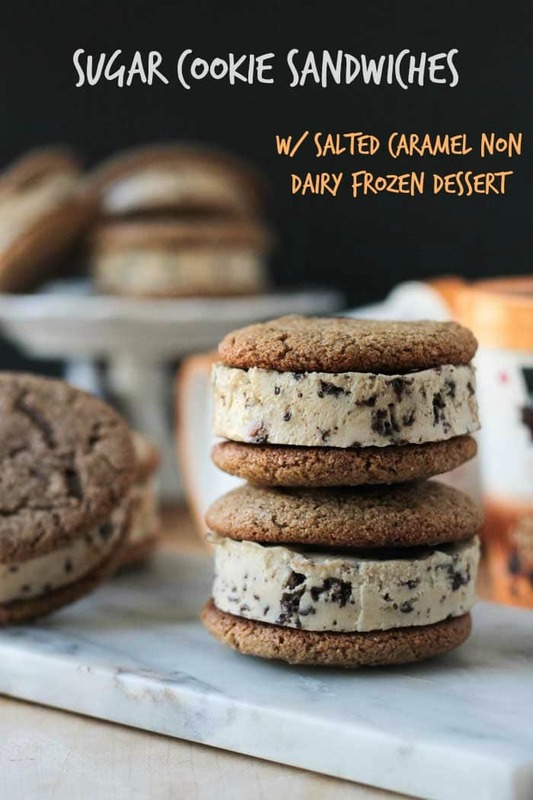 Chewy cinnamon sugar cookies sandwiched around decadent salted caramel non-dairy frozen dessert. These are so easy to make! The perfect summer treat! Make as directed. The cookies should be about 3 inches in diameter after baking. Set aside to cool completely. Line an 8x8 baking dish with parchment paper. Leave the ends of the parchment hanging over two sides to use as handles later. Also, line a baking sheet with parchment and set aside. Place the pints of frozen dessert on the counter and allow them to start to melt and soften. Once softened, scoop both pints into the 8x8 baking dish and spread into an even layer. Cover with plastic wrap and freeze for several hours until completely frozen. Once frozen, using the parchment paper "handles", pull the block of frozen dessert out of the baking dish and place on a cutting board. Using a 3 inch round cookie cutter, gently cut out a circle of the frozen dessert. Place onto one cookie, top with another cookie, and put the cookie sandwich onto the parchment lined baking sheet. Repeat until all the cookies and/or frozen dessert has been used. Roll each cookie sandwich in any optional add-ons you are using and place back on the parchment lined baking sheet. You can eat them right away or place the baking sheet of cookie sandwiches in the freezer for at least 30-60 minutes. Once completely frozen, you can transfer them to a plastic freezer bag or freezer safe container for storage. 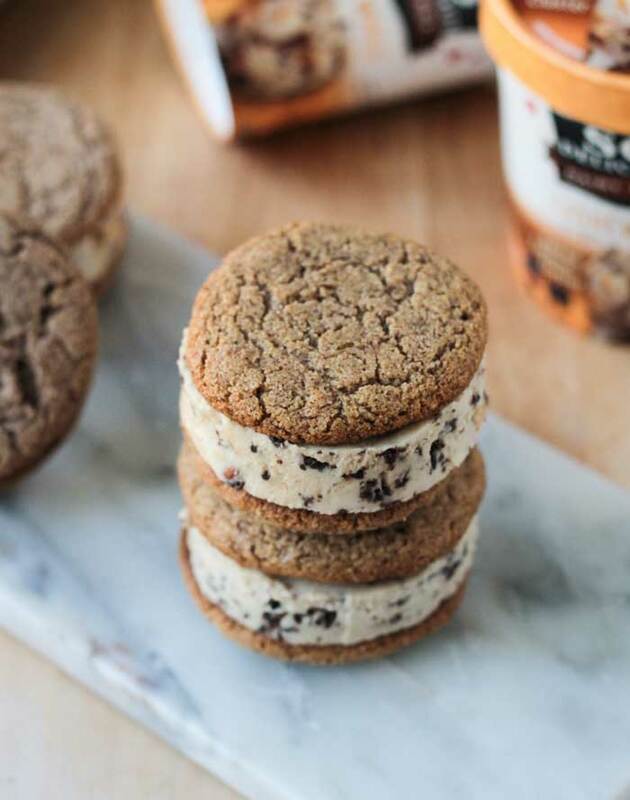 *If you don't want to fuss with having perfect 3 inch circles of salted caramel frozen dessert, simply take one scoop out of the frozen pint, place it on one cookie, top with a second cookie and press down to sandwich it together. Eat immediately, or follow instructions for making them all at once and storing in the freezer. To manage your time best - if you plan to cut the Salted Caramel Frozen Dessert into circles - spread it into the 8x8 dish first and put into the freezer before starting on the cookies. 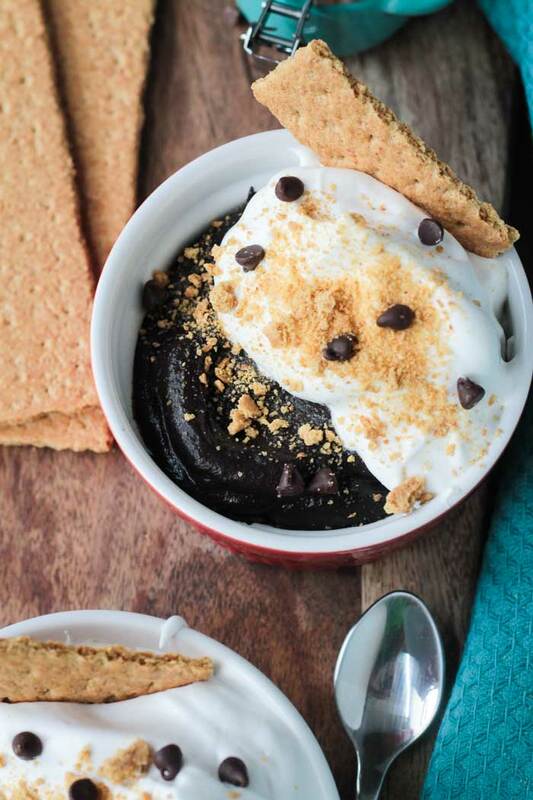 Want more inspiration using So Delicious Dairy Free® Non-Dairy Frozen Desserts? Check it out here. Oh, that’s so awesome that you have a vegan ice cream shop nearby! We have no choice but to make our own. And yes, definitely cheaper! Thanks, Sarah! I was never an ice cream sandwich lover, I got sick off of one as a kid and could never look at them again. But when real cookies get involved in the deal it’s kinda just like dipping a cookie into ice cream. And I LOVE cookies. And I love ice cream, so there isn’t really much to decide on! I pretty much use the ice cream as a dip and devour the entire thing with my cookie spoon because I can’t wait to make it an actual sandwich. This look SO good!!! So Delicious rocks! I love So Delicious ice cream, I have several tubs in my freezer now! These cookie sandwiches look insane, I could eat sooo many of these! Just yummy!! Oh, yes, always the So Delicious in the freezer! I just bought more yesterday too! Thanks, Brandi! Now I want a Sugar Cookie Sandwich. I have some Salted Caramel So Delicious in the freezer but no cookies and it’s nearly 10pm. A bit late for cooking but perhaps tomorrow! Oh, these cookies are sooooo easy! They can be done in 15 minutes. There is always time for cookies! Ugh, Linda, I can’t even imagine! You are rocking it!! And, yes, for sure an ice cream sandwich would be the perfect thing to inhale after 18 miles. LOL!! You should have some awesome weather this weekend though! I am reading this at breakfast and all I want is ice cream now!!!! Looks amazing! What a wonderful combination of flavors AND making it so allergy friendly is awesome. There is nothing wrong with ice cream for breakfast from time to time!! 🙂 Thanks, Julie! Uhhh….move over Klondike bars! Those cookies sandwiches look amazing! HaHa! Klondike who? 🙂 This frozen cinnamon sugar cookie sandwich is where it’s at now! Thanks, Heather! 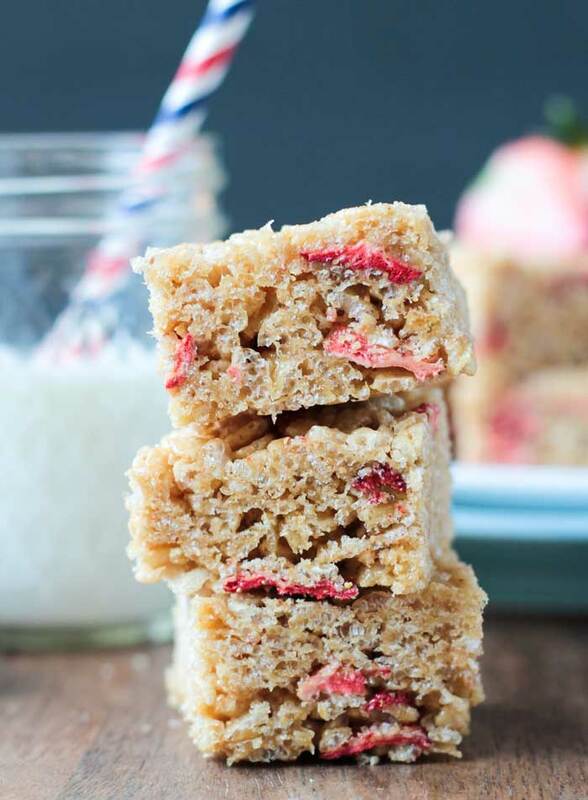 Oh, yet another reason to enjoy those wonderful cinnamon sugar cookies of yours Jenn! These look too good resist. Thanks, Alisa! They are absolutely addictive! Omg, yesss. These sound amazing. ooooh I haven’t had a great ice cream sandwich in ages because I can’t stand those weird one’s we had as kids with the black cake. This looks fabulous!! Oh, yes, those black cake ones stick to the roof of your mouth and don’t even taste like anything. You will LOVE these! Thanks, Amanda! 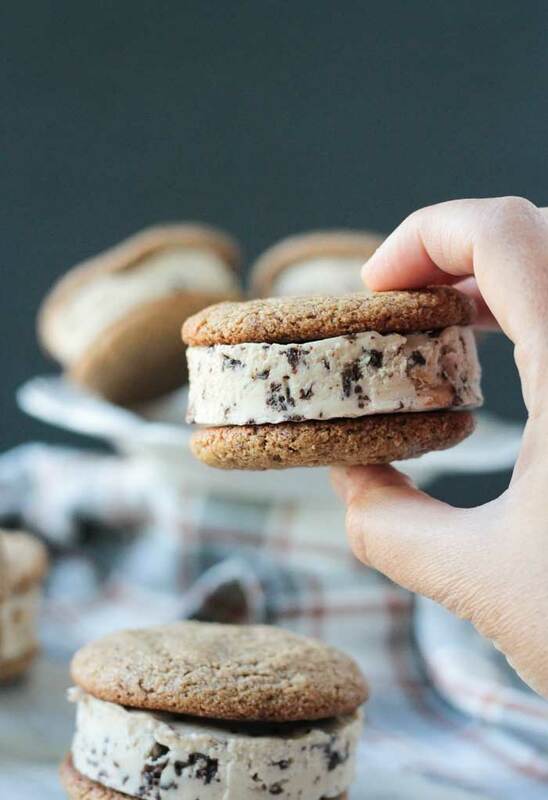 These ice cream sandwiches are the perfect summer treat! I’m a big fan of So Delicious too! They make the best non-dairy frozen dessert! Thanks, Taylor! Definitely can’t let summer end without trying this treat! Sounds delicious! These look amazing! I love So Delicious, especially the cashew milk ones. My boyfriend is going to love these ice cream sandwiches! Those are my favorites too! I hope you guys love them!Thanks, Amy! These look phenomenal! And one of the beauties of living in Florida is that we get to enjoy frozen treats all year round! I’m a huge fan of So Delicious snickerdoodle, we first tried it when my vegan relatives stayed with us last year, can’t wait to try some of these other flavors! Oh, that snickerdoodle is heaven sent for sure! It would be awesome with these cookies as well…cinnamon overload! Not really, because I could never have enough cinnamon! I LOVE cookie ice cream sandwiches! They bring me back to the good-old-days when Dairy Queen served the Chipper Sandwich! These look amazing! The combination of cinnamon and caramel is so delicious! These look amazing! Love the idea of rolling them in sugar too! Yum!